Swiss rolls intimidate me. If I can't even bake a perfect cake, how can I even think of rolling one? 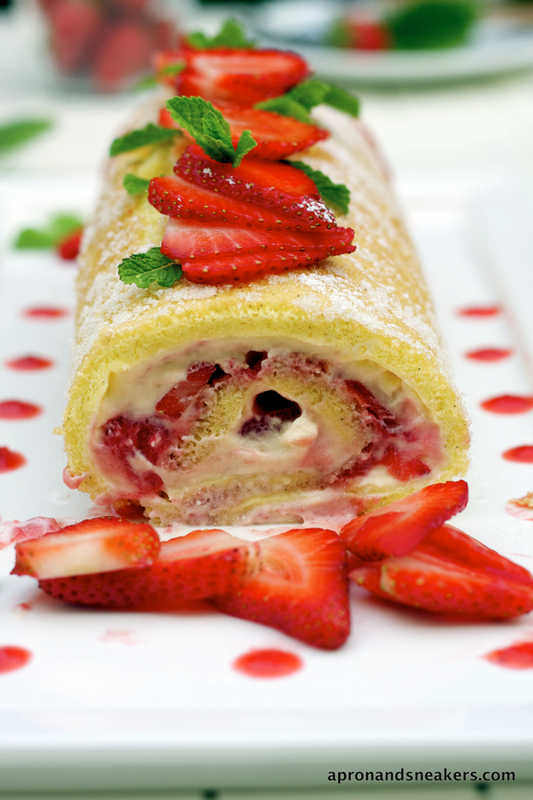 Like all the cakes that I admire but continue to file "to make in the next lifetime", I put away my Swiss roll hope. Then I watched Lorraine Pascale in her cooking show. A whole world of baking possibilities opened up. I usually switch off their voices in my mind when the chefs start explaining how to bake cakes and just look at the videos but when Lorraine started explaining how to make her Swiss roll, she got my attention, all 100% of it. Now, how did that happen? I think it's her relaxed, simple approach to baking and cooking in general that gave me confidence in trying it myself. Sometimes, I tend to be worse than a hurricane in the kitchen. Always in a hurry, moving too fast and not having the time to pause and enjoy what I am doing. I chose to bake on a Sunday when my husband took the kids out for a day in the park. I was alone. I relaxed, I watched all of Lorraine Pascale's recorded shows and I had one unforgettable lunch in front of the TV. I could hear the crunch of the food, I can taste what I was eating and I didn't find the need to stand up every 2 minutes to serve someone or get something missing on the dinner table. I felt like I gained back years lost in hurrying in a matter of minutes. I baked the whole cake for the next hour, unbothered, in the quiet of the house. Maybe what they say is true. Baking is relaxing. It did relax me. I stepped back to take a good look at my handiwork. Now that's a cake. I was happy and quite proud of myself. I should thank Lorraine Pascale, not just for the recipe but for her relaxed way of cooking that influenced me. When my family came back, the cake was the first thing they saw on the kitchen table. How many times have I wished to have a cake that I baked, ready on the table when the kids come home? It was very good that we didn't leave a single crumb. That immediately solved the problem of the roll not keeping for more than 24 hours because it doesn't have butter. It also has mascarpone and that one doesn't keep too long too. I hope you enjoyed this post. Buon appetito! Please don't forget that I still have the giveaway of Bronte pistachios, almond paste brick and Sicilian dried oregano, going on until Sunday, the 3rd of June at 12 Midnight, Rome Time (GMT +2). Please click on this LINK to go to the post with the instructions. Thank you! Put 2/3 of the strawberries in a blender with 2 tablespoons sugar and blend well. Transfer them to a bowl and add the Marsala. Stir in the remaining strawberries and chill for 1/2 an hour in the fridge at the least. The flavour sets better the longer you leave them so a few hours ahead would be better. Preheat oven to 190 degrees Celcius (375F/Gas 5). Grease and line a 23 x 33cm (9in x 13in) Swiss roll tin or small roasting tin with parchment paper. Beat the eggs, 80 g. sugar, vanilla and salt in large bowl with an electric whisk until the mixture is very pale yellow, foamy and mousse-like. Pour the flour on one side of the bowl and fold in gently with a rubber spatula. Add the water. This should help prevent cracking when you roll the cake later. Don't overmix so that the cake doesn't lose the air and fold as less as possible. Pour the mixture in the prepared tin and level it gently with a palette knife. Bake for 10 -15 minutes. 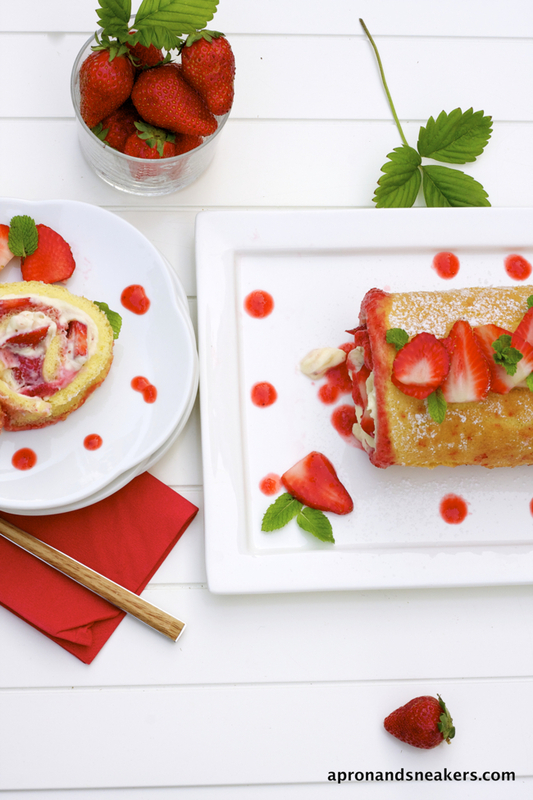 Remove the cake from the oven and turn the cake out onto a sheet of baking paper sprinkled with caster sugar. Leave to cool for 10 minutes, then gently peel the lining paper off the sponge and leave to cool completely. Mix mascarpone, icing sugar & vanilla in a bowl. Trim off any rough edges of the cake with a sharp knife to make the sides tidy. 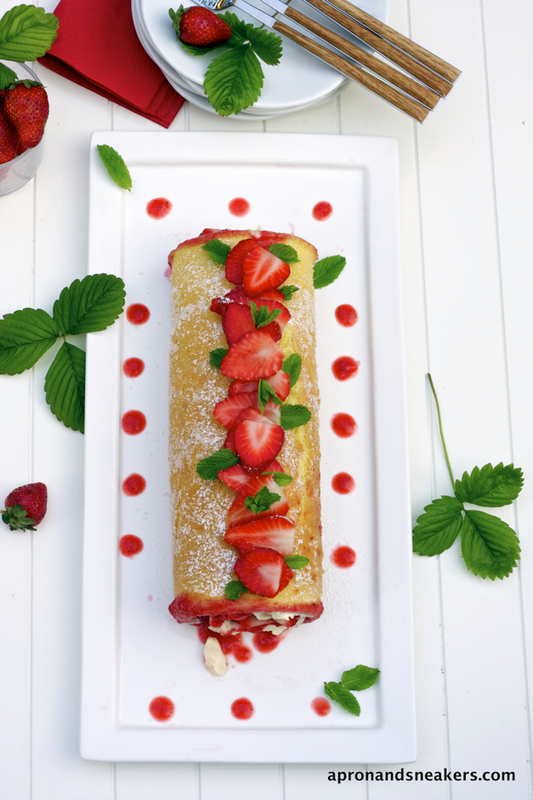 Spread the mascarpone cream all over the sponge, leaving just a small margin so that it doesn't squelch out when rolling. Leave about 2 tablespoons to fill up the ends of the roll when finished. 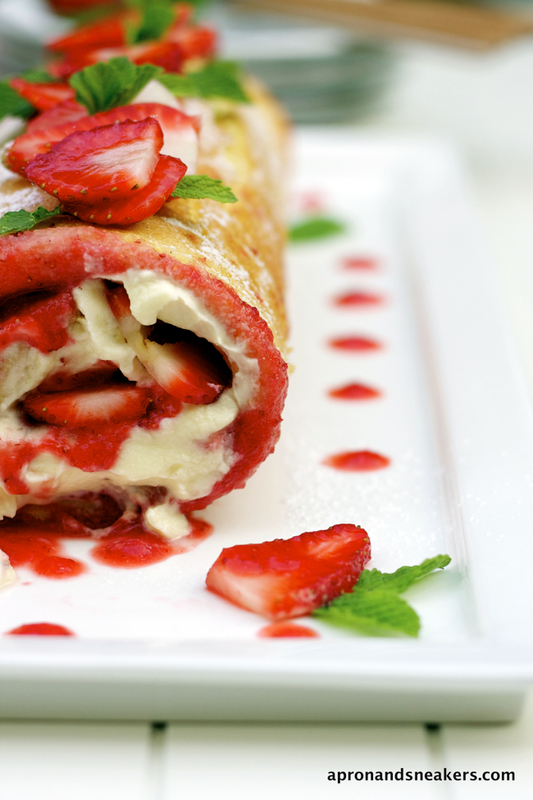 Spoon the macerated strawberries over the mascarpone cream and spread evenly. 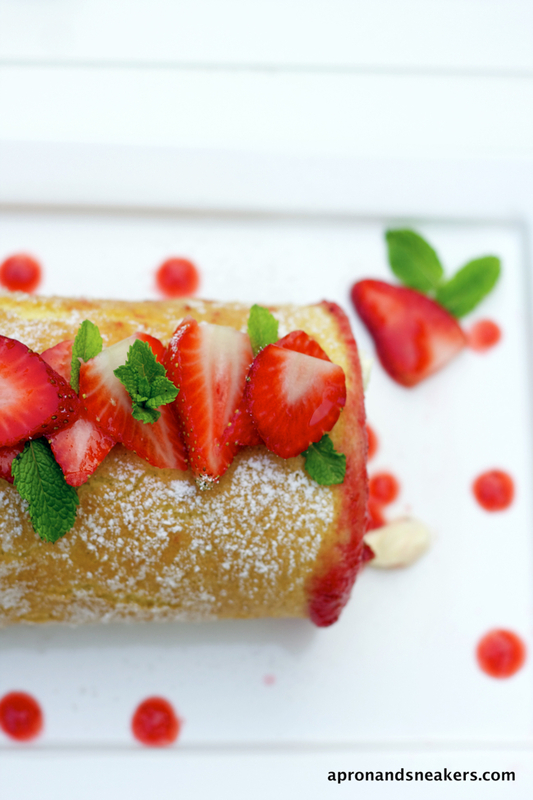 With the shorter side facing you, roll the sponge (going forward, away from you) using the parchment paper to help. Try to roll it as tightly as you could. Leave about a tablespoon to fill up the ends of the roll when finished. Once you have rolled it all up, make sure the end part is underneath so it doesn't open. Transfer to a serving plate carefully. 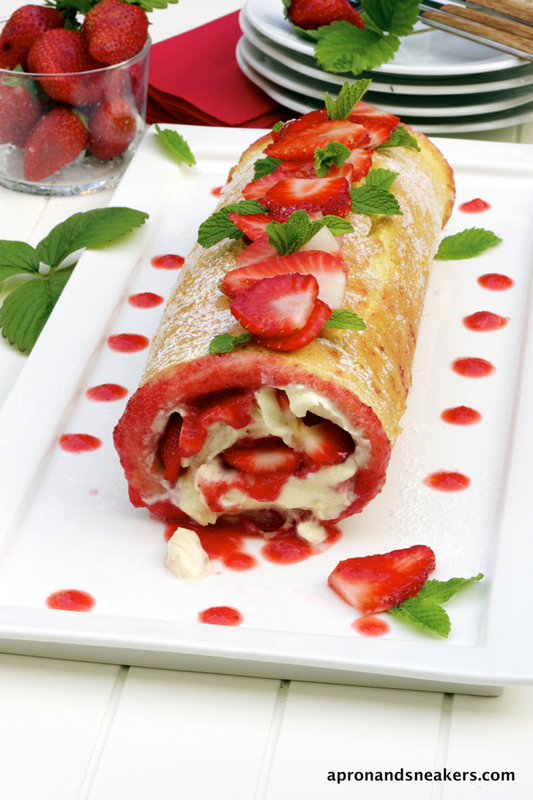 If the ends of the roll are a bit empty, fill them up with the mascarpone & strawberry filling you set aside. 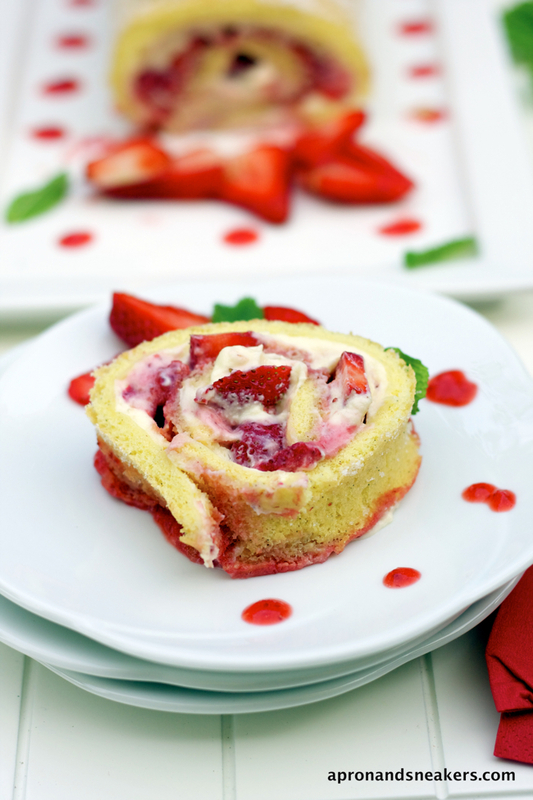 Sprinkle with caster sugar and decorate with the extra strawberries.